BEST LUMBAR SUPPORT - If you are spending more than 8 hours a day in a seated position, this comfortable cushion is just right for you. It provides additional support you need to maintain good posture and the natural curve of the spine. 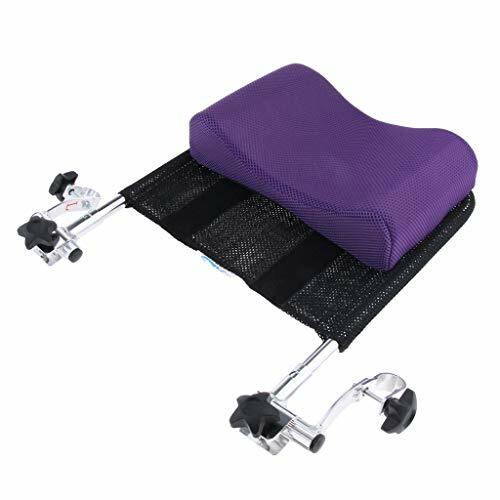 The ergonomic design helps increase blood flow, prevents muscle fatigue and back tightness, supports mid and lower back, and allows you to sit upright naturally without pain. HIGH QUALITY - Measuring 15.7x15.7x3.2, the lumbar pillow comes with a removable and breathable black mesh cover, that provides great air circulation and allows you to sit without feeling hot or sweaty. The back cushion insert is made from 100% Memory Foam that conforms to your individual shape, provides better contouring and pressure relief. Two adjustable elastic straps securely fit the pillow to an office chair of any size and design. WORKS WITH ANY CHAIR - This ergonomic back cushion nicely fits most office chairs, even those with a high back. You can raise or lower the product to your personal comfort level. Also it\'s a good option to consider, if you move around a lot. Take it in your car, on a plane or a train. Great for office use, frequent travelers, sport events and pregnancy. 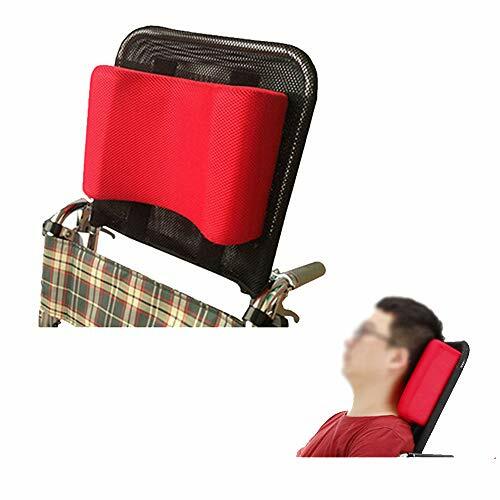 No matter where you sit, this cushion will help to reduce neck, shoulder, and back pain to power through your day. 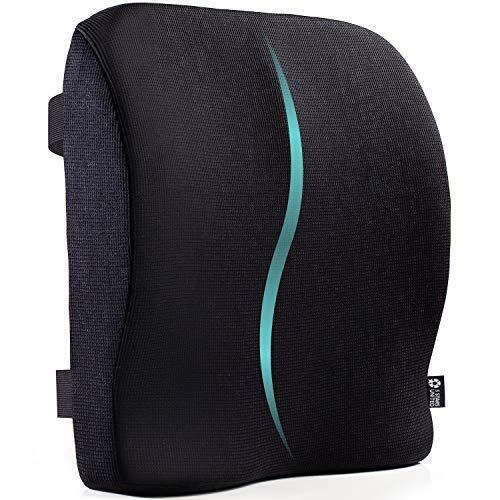 ORTHOPEDIC DOCTOR RECOMMENDED - This back pad repeats the anatomical contours of your spine, supports your lumbar area, and lessens the pressure on your back. It prevents the occurrence and progression of spine diseases and ensures health and comfort. The streamline pillow can also be used for scoliosis and compressed disks, if recommended by a professional. Please note! This pillow is firm and supportive, not soft. 100% MONEY-BACK SATISFACTION GUARANTEE - 5 STARS UNITED wants you to be absolutely happy with your purchase! If our product does not work for you for any reason, return it for a full refund. You will get 100% money back with no questions asked. You take NO RISK by ordering today! Durable wheelchair bag attaches with two easily adjustable straps, allowing it to fit on all standard wheelchairs, bariatric wheelchairs walkers and transport chairs. Easily keep essentials at hand with the large inner pocket measuring 19"x 14". Sturdy nylon bag can hold a purse, a change of clothes, or necessary medical supplies. Two convenient outer pockets provide easy access to everyday items such as drinks and snacks, glasses, electronic devices and more. 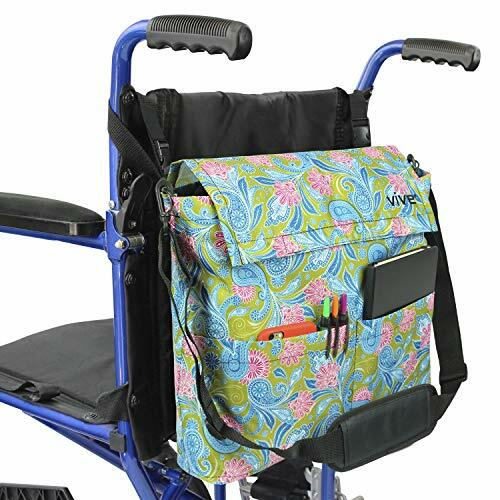 Easily attach and remove the carry bag with the durable adjustable straps that fit most wheelchairs. 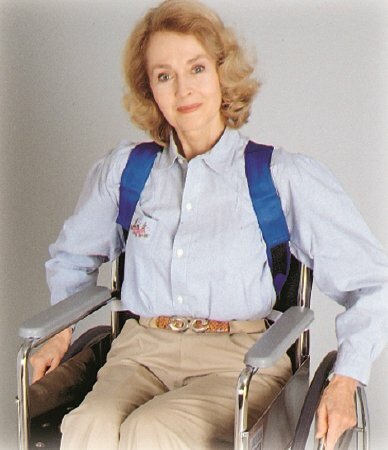 An easy to use buckle system secures the straps to any wheelchair, walker or transport chair. 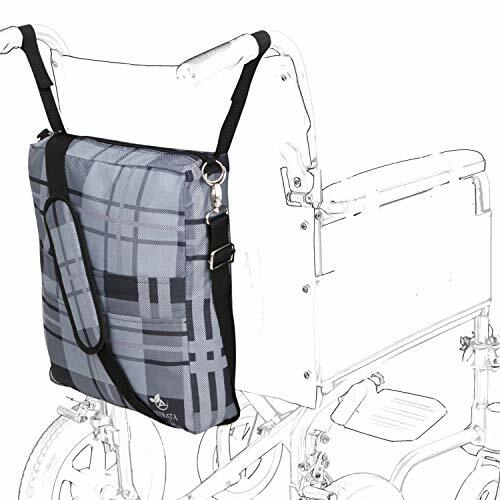 An additional padded shoulder strap allows the bag to be easily transported to and from the wheelchair. 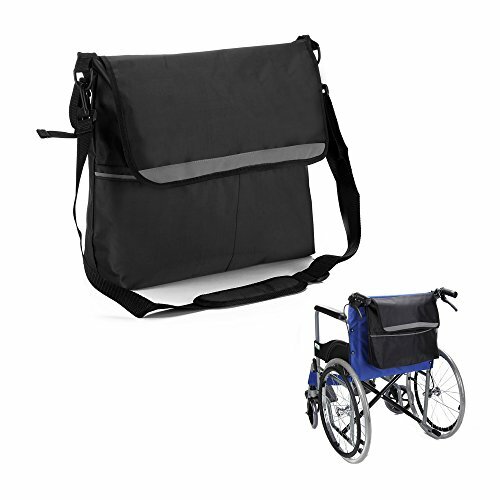 Constructed with a durable, lightweight nylon material, the wheelchair bag is waterproof to keep contents safe and dry. For additional convenience, the outer pocket is lined with a reflective stripe for high visibility at night or when in low light areas. Durable nylon material is machine washable for added convenience. For best results, machine wash in cold water and allow bag to air dry. 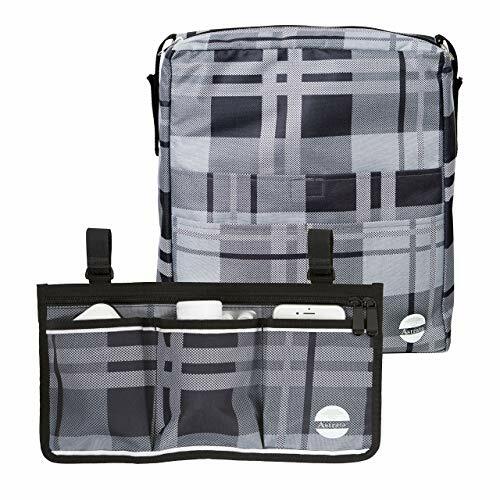 HANDS FREE GRAB AND GO BAG: Easily keep essentials at hand with the large inner pocket measuring 19x 14. Sturdy nylon bag can hold a purse, a change of clothes, or necessary medical supplies. Two convenient outer pockets provide easy access to everyday items such as drinks and snacks, glasses, electronic devices and more. 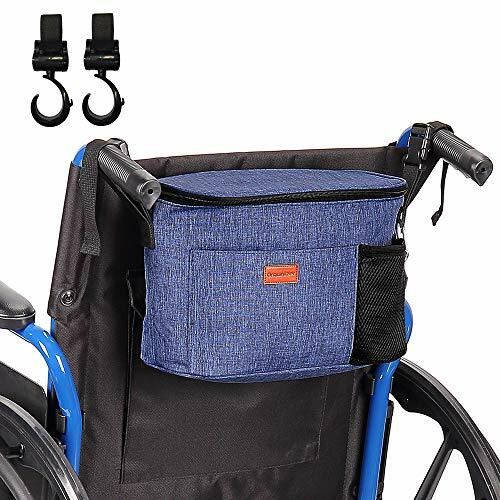 LIGHTWEIGHT WATERPROOF AND MACHINE WASHABLE: Constructed with a durable, lightweight nylon material, the wheelchair bag is waterproof to keep contents safe and dry. For additional convenience, the outer pocket is lined with a reflective stripe for high visibility at night or when in low light areas. Durable nylon material is machine washable for added convenience. For best results, machine wash in cold water and allow bag to air dry. Together these two bags provide the perfect combination for convenience and ease of use for everyone using a wheelchair. Quickly and easily access your most important things instead of having to look for your things all day every day. EXTRA SPACE AND SECURITY FOR LARGER ITEMS! This bag is specially designed for those needing extra space on their journey. The larger back bag is ideal for those sick of carrying heavy items and looking for a suitable and easily accessible place to put them. Larger electronic devices, water bottles Lunch boxes, large food items, books Clothing, small umbrellas and other essentials! This beautiful bag has two small front pockets, two large front pockets - that can transform to one larger pocket and large zipper opened bag. These bags have Velcro straps that allow for effortless application and adjustments. They are specifically designed to be short to ensure a strong tight fit to the armrest. 2 WHEELCHAIR BAGS FOR THE PRICE OF ONE - Why choose between buying a side bag or a back bag when you can buy both at once?! One side wheelchair bag and One wheelchair back bag. These are 2 premium quality wheelchair bags that will allow you to easily keep your essential items in one or the other, giving you the convenient to alternate use of each bag depending on the occasion or what you need. ABUNDANT SPACE FOR YOUR TOTAL CONVENIENCE - Keep everything you need for your journey in one place! Avoid making both your hands and your lap carry heavy items. Both bags are generous in size and come with plenty of pockets which allows you to compartmentalise everything you need for your journey. You won't find yourself digging through you bag looking for your stuff with these bags! LIGHTWEIGHT AND DURABLE MATERIAL- Constructed using lightweight and tough durable material. 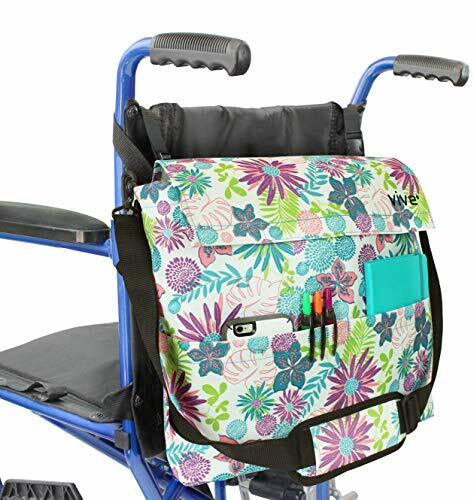 Both bags are crafted using polyester water resistant fabric specially chosen so that it will be easy to clean, sit lightly on your wheelchair and still be sturdy enough hold most of your items. QUICK & EASILY ADJUSTABLE STRAPS- The Velcro straps are quick to adjust when you need a quick fix! Just undo the strap and loop around the wheelchair arm. They are the perfect length, not so long that they will drag on the wheels of your wheelchair but not so short that they won't be able to wrap around the arm of your chair.  TWO IN ONE Wheelchair Bag - Why choose between buying a side organizer or a travel bag when you can buy both at once?! One wheelchair pouch bag for immediate access and one wheelchair backpack on the back for the bigger items. YOUR PERFECT ORGANIZERS - Abundant space for your total convenience! With this travel backpack and storage bags you have instant access to your everyday items such as phone, drinks, snacks, wallets, glasses, medications and much more.  SATISFACTION GUARANTEED - Love them or we will buy them back from you, no questions asked! Keep your essentials health items with you stored within arm's reach with these travel accessories. 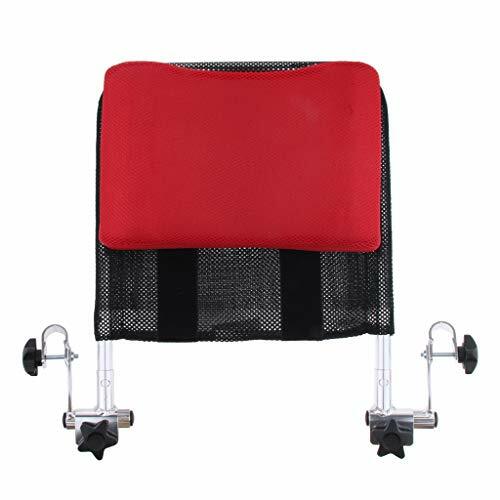  LIGHTWEIGHT & DURABLE ITEMS HOLDER - Easy to use and maintain wheelchair accesories. These wheelchair bags are crafted using polyester water-resistant fabric, chosen to be easy to clean, lightweight and made with you in mind with its multi-pocket designed for plenty of storage space.  BEAUTIFUL VERSATILE TRAVELBAGS - These versatile wheelchairs accessories fits most mobility aids such as walker, scooter, rollator, folding manual and motorized electric powered wheel chair. They are the perfect gift for your loved ones or yourself. This patent pending memory foam back cushion by Aylio provides lumbar support in a chair or car seat. It features ridges for the spine for added comfort and a strap to secure it in place. Soft cover is removable for easy cleaning. Meausures 18" long x 16" wide x 3" thick. - Breathable mesh cloth and sponge head pillow, Aluminum Alloy brace, Lightweight and firm. - Convenient: When you dont use it or want to close the wheelchair, you just need to remove the headrest part . * Convenient: When you dont use it or want to close the wheelchair, you just need to remove the headrest part . * Breathable mesh cloth and sponge head pillow, Aluminum Alloy brace, Lightweight and firm. WHEELCHAIR BACK BAG (BLACK) GREATER CONVENIENCE THROUGH QUICK & HASSLE FREE ACCESS! Spacious and stylish, the wheelchair back bag is perfectly designed with compartments fitting for all your items. Keys, wallets, cell phone, notebooks, Your lunch, your bottles, you can now STOP digging the bottom of your purse for them because with these bags, there a place for each item! YOUR PERFECT ORGANIZER - Never forget your stuff again! 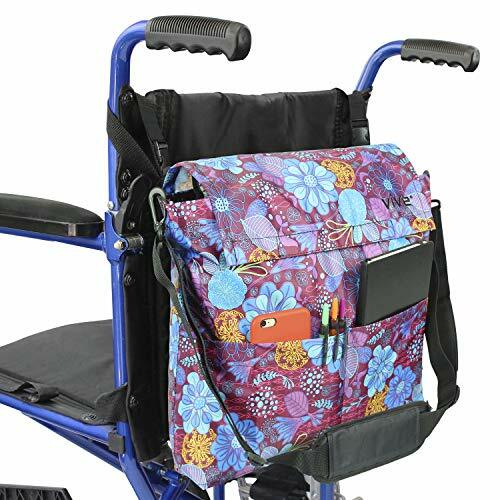 Make sure you have access to all your everyday essential items, your phone, drinks, snacks, wallets, glasses, medication, medical devices and much more with this wheel chair back accessory bag! EASY QUICK ACCESS - Need a quick drink? Urgently need your medication? Maybe you just want a quick snack? Have INSTANT access and keep all your important items available in close proximity, within arm's reach! LIGHTWEIGHT & SPACIOUS - This back bag is crafted using polyester water-resistant fabric, chosen to be easy to clean and lightweight. AND it has compartmentalized multi-pocket design which not only provides plenty of storage space but also allows you to organize each space with the item you want. PORTABLE & VERSATILE - This versatile wheelchair back bag fits most mobility aids such as a walker, scooter, rollator, manual and motorized electric powered wheelchair. Its portability and spacious size allow users to adapt the bag to fit their needs. Use it as a tote travel bag, a grocery bag or an everyday accessory item holder! SATISFACTION GUARANTEED - Love it or we will wheelchair from you, no questions asked! Keep all your essentials health items with you stored within arm's reach with this travel accessory.  Head pillow part with hook and loop straps, height is adjusted.  Al-alloy hardware with adjustable design, can choose a comfortable angle.  Foam padding head pillow with breathable mesh cover.  Removable Design convenience and saving space. Easy to install without tools, instructions is included. Fits any 16 to 20 inch wheelchair with back handle tube .  Don't worried, any questions, contact us, please.  We guarantee your 100% Satisfaction Guarantee!  Good Flexibility angle and height adjustable.  Sponge padding head pillow with breathable mesh cover.  Easy to install without tools, instructions is included.  Fits any 16 to 20 inch wheelchair with back handle tube . 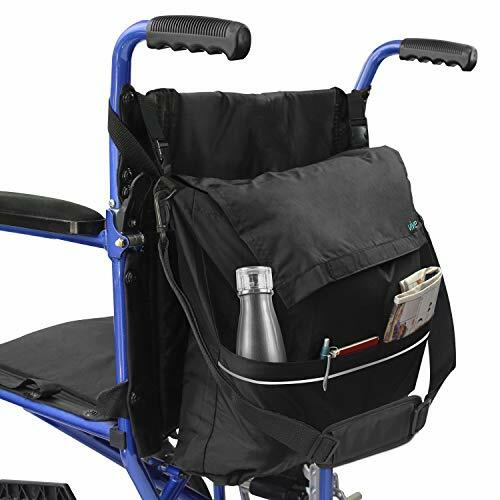 1.Multifunction: The Wheelchair Back Bag has 2 ways to use, hanging behind the wheelchair or hanging on your shoulder. 2.Large capacity: it is enough to keep your essential everyday items such as drinks and snacks, glasses, electronic devices and more. 3.Fit for all standard wheelchair rollator rolling walkers transport chairs baby strollers. 4.The double-layer mesh side pocket on the back can easily accommodate an ipad. 5.Easy to install and adjustable: You can attach and remove the carry bag easily with the durable adjustable straps. 6.Waterproof and moisture proof: Made of a durable and lightweight nylon material, the wheelchair bag can keep contents safe and dry. 7.The non-slip design of the shoulder strap makes the leather is skin-friendly, and the widening design can reduce shoulder pressure. 70 days unconditional guarantee, so you can purchase now with confidence. And If you have any question about our product, please free to contact us. Multifunction: 2 ways to use, hanging behind the wheelchair or hanging on your shoulder( with shoulder straps). And it is enough to keep your essential everyday items such as water bottle, drinks and snacks, glasses, electronic devices and small items. More Convenient: 2 Piece of Multi Purpose Hooks secure your shopping bags, clothing bags, backpacks, purses, or anything you need to carry. Fit for all standard wheelchair rollator rolling walkers transport chairs baby strollers. A good choice for your mother or wife. Easy to install and adjustable: You can attach and remove the carry bag easily with the durable adjustable straps. Waterproof and moisture proof: Made of a durable and lightweight nylon well made material, the wheelchair bag can keep contents safe and dry. Small/Medium size for patients up to 170lbs. Medium/Large size for patients over 170lbs. 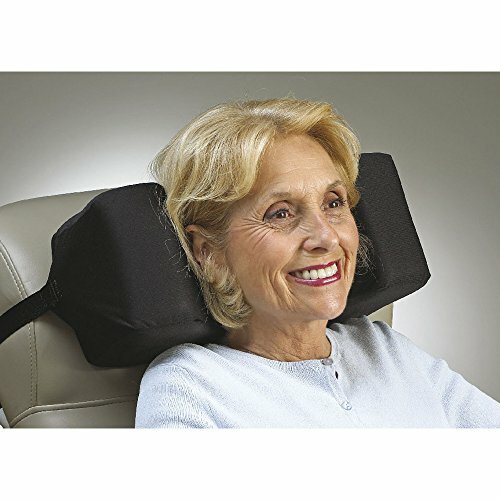 Optional Headrest Accessory Used with the Reclining Wheelchair Backrest and the Airflow Reclining Backrest. REMOVE COVER TO LAUNDER IN WASHING MACHINE. Fits User: Seniors, Handicapped, Elderly, Disabled, Bariatric patients. 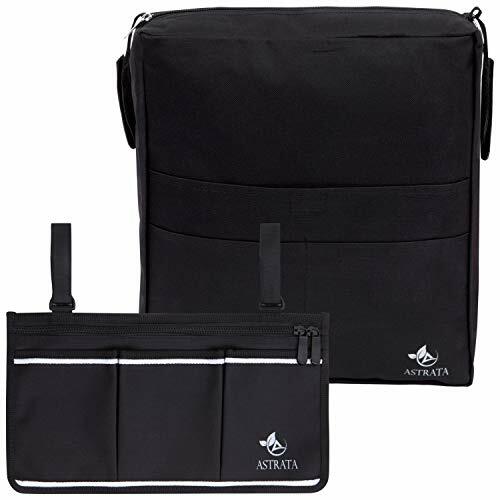 Size: 12" x 7" - Sturdy wheelchair bag can storage wallets, change clothes, or necessary medical supplies in large volumes. protecting your items from unexpected spills. Two convenient outer pockets provide easy access to everyday items such as drinks and snacks, glasses, electronic devices and more. 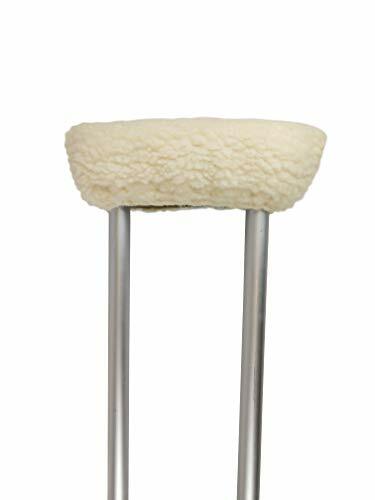 Fits most standard power / manual electrical wheelchairs, walkers, rollators, armchairs, bariatric transport chairs, mobility scooters, folding bed rail. Wheelchair backpack attches easily on the back of your wheelchair with flexible and adjustable straps. An additional padded shoulder strap allows the bag to be easily transported to and from the wheelchair. Wheelchair cover Reflective stripes makes you visible from up to 100 meters at night. Cleaning: only need to wipe with a rag. Experience the Next Generation of Lightweight and Fold-able Mobility Aids -- a Beautifully designed and extremely well crafted frame for comfortable riding supporting users up to 330 pounds. 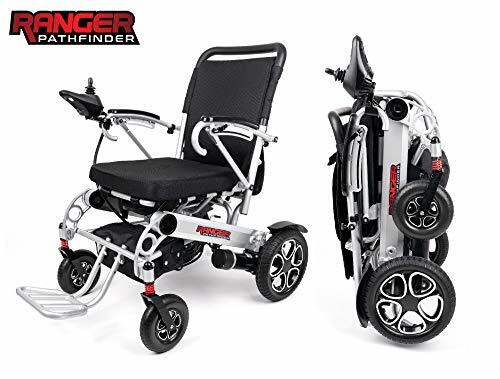 The RANGER X6 Model by Porto Mobility is equipped with 8" Front Wheels and 12.5" Rear Wheels. It has the Quickest & Easiest Folding and Unfolding action ever. It literally will unfold in one second. Also TSA and Airlines / Cruise Ship Travel Approved Folding Power Chair. Your purchase of an RANGER X6 includes everything you need to use it. included in each order will be one 10 Ah Battery, one Battery Charger and of course the Controller Joystick. Light Weight Frame Design & Extremely Durable Construction Folds and Unfolds Quickly & Easily -- Very Portable When Folded Red tail lamp for safer night rides ON or 0FF Board Rechargeable Lithium Battery -- 15 KMs in Driving Range Joystick Mounting Available for Right Hand or Left Hand Usage Adjustable Seat Back Height Controller can be easily mounted on both sides! Arm Rests Height 3 level adjustable and Can Be Raised for Easy & Convenient Side Access Manual mode switch allows caregiver push the chair Mikon Brand (One of the 10 Best) Dual Powerful Motors Removable Seat Cover for Easy Cleaning Built in USB Phone Charger Comprehensive Service & Maintenance Library American Based After Sales Support Headquartered in California Thousands of REAL and Happy Users Worldwide All Parts available for additional Request Warranty covers all parts post-purchase Open Size: 43.3x25.2x37" Folded Size: 25.2x17x33"
Porto Mobility is a US Company that is committed to offer the best Mobility Products. All Products Backed By Porto Mobility Standard 24x7 Customer Support! Weighs Only 63 Pounds (net) & Carries Passengers up to 330 Pounds. 19 between armrests and ample of room with 17 seat cushion as the sides are open concept. Portable Wheelchair, Foldable in seconds, Air travelling approved. No Need to Install a Lift on your Car or SUV to transport. Fits in car trunks equal or bigger than a Honda Civic / Ford Focus / Chevy Cruze. Small Turning Radius of Only 33 inches -- Gets around tight areas easily.Costs Less than Older model & much heavier Power Electric Wheelchairs. Do you wanna feel cool, soothing and without any pain when you are seating? You can have it MiroPure 2 in 1 lumbar cushion set. With the best support design, which fits the streamline of your spine arc will unbelievable support your back and alleviate pain even if you are seating for a long time! Why you chose MiroPure lumbar cushion? Free Bonus: Each package include a lumbar cushion and a neck pillow which is value for money Premium Quality No gross chemical smell that makes you sick and stinks up the room or car! 100% premium memory foam material. Technically made it the right amount of the firmness to give you the right support you need. Lumbar Support: The Backguard gently supports your lower back's natural arc to help you sit up confidently and maintain healthy vibrant posture! You'll start feeling more relaxed and refreshed both while you're sitting AND when you get up! Customer Service: You are protected by a 360 day, no-questions asked money back guarantee and world class personal customer service! Enjoy your risk free purchase now! SIT COMFORTABLE WITH PREMIUM QUALITY LUMBAR CUSHION : 100% pure high-density premium quality memory foam plus right amount of firmness made it lasts years and don't go flat. PROMOTES SPINE'S NATURAL ARC, SIT PAIN FREE: Ergonomic designed to fits the streamline of your spine arc, Supportive to improve your healthy sitting posture,prevent back pain or chronic lumbar muscle strain. BREATHABLE AND SOFT COVER WITH ADJUSTABLE STRAP: breathable material for center space while comfortable short hair velvet for the rest part , keeps you cool and cozy prolonged periods of use. Also easy to remove and clean. FREE BONUS OF NECK PILLOW: Packed with free neck pillw. it's skin adaptable short hair velvet cover will make your neck feel great when relax on any chair, like car chair,office chair, Lounge chair. 100% CUSTOMER SATISFACTION: we offer Lifetime warranty and provide word class customer service. Enjoy this absolutely RISK FREE purchase today.